For the past two days we have been playing proper tourists, seeing the sights of Lisbon. Originally we planned just one day. Lisbon being such an historic city, older than Rome, there was little chance of us managing to do it full justice. John did some research and decided we should concentrate on the Belem area. Even doing this we still did not manage to see everything there and definitely needed the extra day. We have taken the in train both times. On the first journey our train sailed straight past Belem, despite the fact that it is the focus of tourist attractions. We went on a couple of stops to the end of the line, disembarked, consulted the billboard and stepped back onto the same train, which duly pulled up at Belem on its way back. At least at the end of the day we knew where to get on, but that train stopped after only a few stations and everyone got off. Prompted by a thoughtful fellow passenger we followed suite. Another train pulled up alongside and we all climbed in and completed our journey. Most odd. The following day the train out stopped at Belem on our way there and the train back went all the way to Cascais. On our first day we visited the Mosterio dos Jeronimos, a huge ornate building like a white version of the Palace of Westminster. It is five hundred years old and has been both a religious and a civic site of importance. Vasco de Gama prayed there before setting off for India and has been duly granted tomb space. As we approached the Monastery we passed a large restaurant with a long, unruly queue outside, odd at such and early time on a weekday morning. We could only assume that it had a local reputation for being the place to buy the traditional custard tarts. Next door but one to it was Starbucks, with no queue whatever and round the corner from that an old street tram serving coffees was surrounded by deserted tables. The tops of which were printed with rather handy maps. Startlingly, a tram service was still running right up to the café car. Primed with the need to get on we hurried past all of these refreshment stops in favour of the Monastery. We bought tickets and explored the ornate cloisters, which were on two levels. It was rather like wandering around an elaborately iced wedding cake. 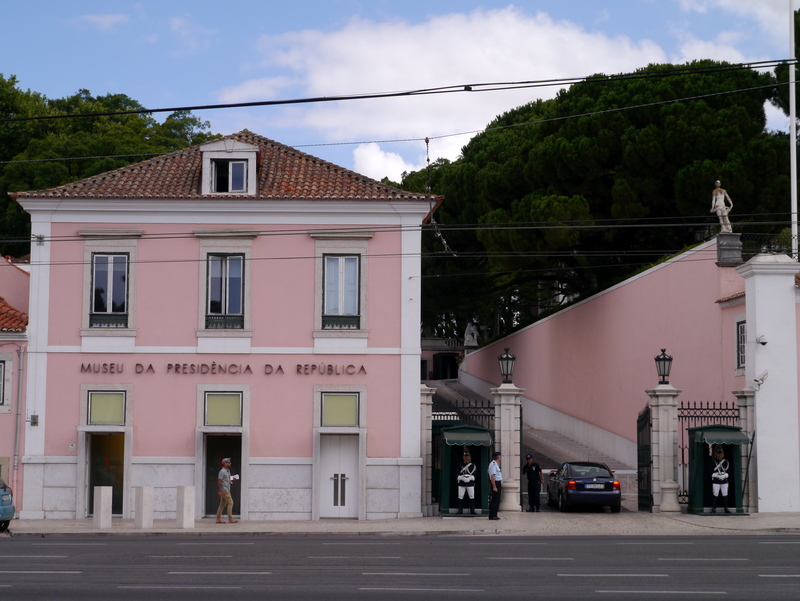 On the ground floor one side housed the vast, tiled, rather dank ancient refractory, another side held an exhibition around the tomb of a famous Portuguese liberal thinker, writer and politician, Alexander Herculano. He had been the librarian here and there were signs for the ancient library, I was excited by the prospect of old books. On the next side of the cloister stood a row of black doors, each with differently carved surrounds, most were small confessionals, but the first door in the line opened on to a vast staircase, designed to travel the full length of the cloister in order to mount its’ soaring arches. This lead to the upper storey and, it promised, the ancient library. By turning left at the top of the staircase we found ourselves on a balcony looking down into the cavern of the cathedral part of the monastery. The roof soared even higher on slender, white pillars, ghostly in the dim light of the tall stained glass windows. Back at the top of the stairs we took the right turn out onto the upper storey of the cloister. The library aptly occupied the space above Herculano’s tomb. There were no old books. There was an exhibition to commemorate the five hundred year anniversary of the monastery in the form of a timeline housed on a swirling panel, higher than John winding around the room. One side was in English and the other Portuguese, words and pictures illustrated in three parallel lines the history of the world, the monastery and the Portuguese nation. We inched our way along the English face, reading intently and emerged slightly disorientated back at the door. After making a circuit of the upper level we went back to try to get into the cathedral at ground level. On re-entering the lower cloister we heard beautiful singing from above. In the centre of the quad a man in a white panama hat stood conducting, slowly rotating as he did so. All around the upper level girls, seemingly ordinary tourists, were singing in Latin. We stood entranced until he brought them all to their close and then everyone, including the singers, applauded. After this we toured the cathedral, spotting Vasco on our way out. Our next stop was the Maritime Museum, though it was actually housed further along in the same monumental building. First we had lunch sat outside the cafeteria before heading off into the museum. I have dutifully accompanied John around a number of Maritime Museums and did not hold out great expectations for this one. I was proved very wrong. As well as the bits of ship, portraits of sailors and cabinets of knots were marvellous model sailing boats, old scientific instruments, globes and maps, such wonders as astrolabes, huge hand drawn atlases, diaries with sketches and a mappa mundi. The museum allowed photography so long as flash was not used, so I framed up and snapped away happily. Finally we went through a hanger full of actual boats, royal barges, yachts and old sea planes. After all this we could take in no more and set off back to Lyra on our interrupted train ride. Next day we started with the Botanic Gardens, where I was nearly adopted by some ducklings. A rather ugly duck was standing in the shade with four frothy ducklings. I crouched down to photograph them and they came right up and milled around me. I could not stand back up for fear of treading on one. Their mum was close behind and a little threatening as she circled me too. John told me when I could rock back on my heel to get up and I moved away. They followed! I hurried. They began to run and carried on running, fanning out for a worryingly long time. It was a relief when they finally turned back to mum. The gardens are behind the president’s palace and has some impressively ancient trees and a Japanese garden, with teahouse and moon gate, but they looked a bit sad and neglected. 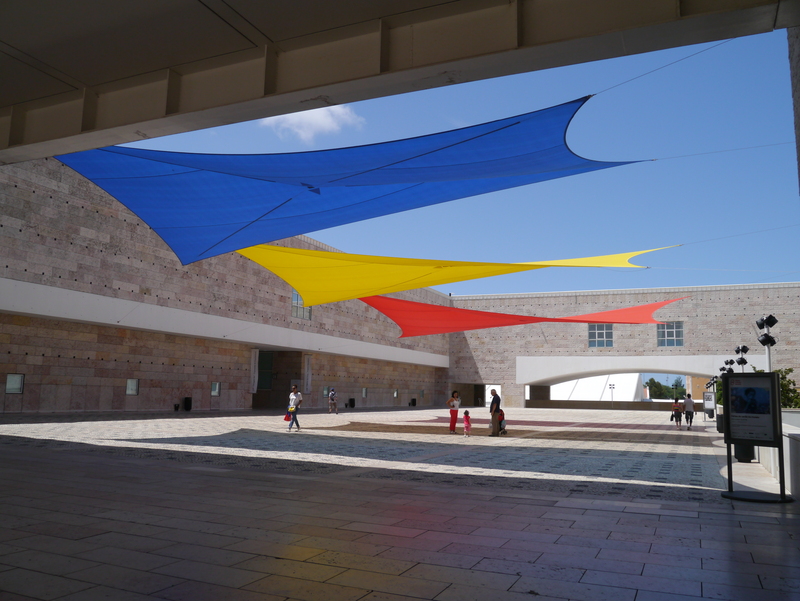 Our next stop, the Centro Cultural de Belem, which houses the Berardo Collection of twentieth century art, could not have been more different. Housed in a vast, but contemporary building the collection weaves an impressive narrative through the many artistic isms of the last century. Its emphasis was on displaying apt examples of the art rather than particular favoured artists, though the big names were certainly well represented. It was a treat to be able to look at such work in comparative peace without the crowds. The art was thoughtfully presented in spacious rooms, with lucid information in both English and Portuguese and the facilities were first rate. We also enjoyed the collection of advertising originals, displayed chronologically on the lowest floor. After our tour we ate sushi in their garden restaurant. Our table overlooked the towering Monument to the Discoveries, with Portuguese explorers sculpured mounting the prow of a ship. Ant like figures milled around the base and a few brave souls were mere specs looking over the parapet at the top. We decided to give this one a miss. 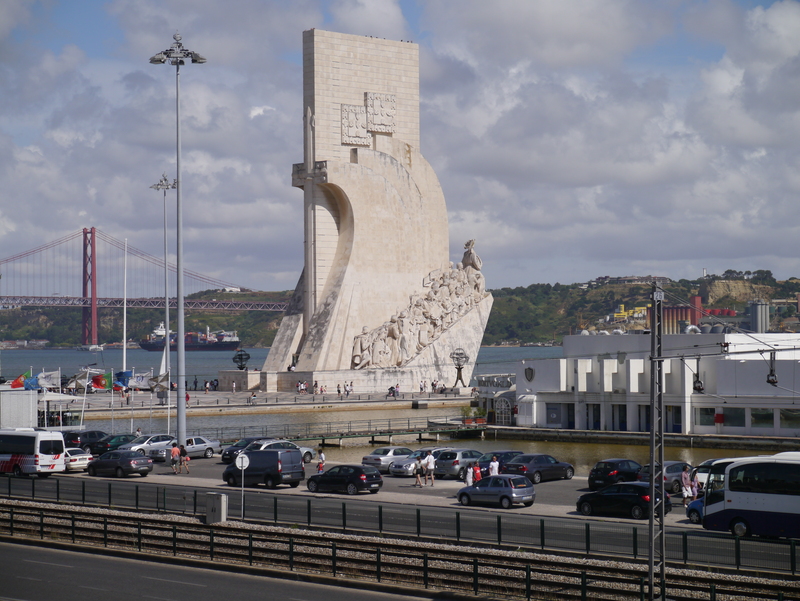 We also missed the Torre de Belem, the museum housing filigree coaches and probably much more besides. John bought me an art book of the Berando collection, such a treat, and carried it home for me. This entry was posted in sight seeing and tagged art, cathedral, Garden, Lisbon, museums, Vasco de Gama. Bookmark the permalink.